Members of The Church of Jesus Christ of Latter-day Saints (sometimes inadvertently called the “Mormon Church) witness that the Savior lives! We worship the living Christ and testify that He is intimately involved with His children on earth, that although He is all-knowing and all-powerful, He is also all-loving. Jesus Christ has witnessed of Himself, His Father has witnessed of Him, and the Holy Ghost is constantly witnessing of Him. This article deals with those who have seen Him. Some of these reports are familiar from the Bible, but others are from other scriptures canonized by the Church of Jesus Christ; they provide an additional witness that the biblical account of Christ’s birth, ministry, crucifixion, and resurrection are true. And the Lord said unto him: Because of thy faith thou hast seen that I shall take upon me flesh and blood; and never has man come before me with such exceeding faith as thou hast;…And the Lord said unto him: Believest thou the words which I shall speak? And he answered: Yea, Lord, I know that thou speakest the truth, for thou art a God of truth, and canst not lie. And when he had said these words, behold, the Lord showed himself unto him, and said: Because thou knowest these things ye are redeemed from the fall; therefore ye are brought back into my presence; therefore I show myself unto you. Behold, this body, which ye now behold, is the body of my spirit; and man have I created after the body of my spirit; and even as I appear unto thee to be in the spirit will I appear unto my people in the flesh (Ether 3:9, 11-16). And my brother, Jacob, also has seen him as I have seen him; wherefore, I will send their words forth unto my children to prove unto them that my words are true. Wherefore, by the words of three, God hath said, I will establish my word. Nevertheless, God sendeth more witnesses, and he proveth all his words (2 Nephi 11:2, 3). After Christ’s crucifixion and resurrection, He came from heaven and taught His apostles to prepare them for their ministry. They saw Him return to heaven in like manner. Christ then visited the “other sheep” He had mentioned to the apostles, a branch of Israel that had been led from Jerusalem to the Americas. (See John 10:16.) When Christ visited these Israelites in the Americas, He called twelve disciples to establish His Church and taught and healed the people. Behold my Beloved Son, in whom I am well pleased, in whom I have glorified my name—hear ye him. And it came to pass, as they understood they cast their eyes up again towards heaven; and behold, they saw a Man descending out of heaven; and he was clothed in a white robe; and he came down and stood in the midst of them; and the eyes of the whole multitude were turned upon him, and they durst not open their mouths, even one to another, and wist not what it meant, for they thought it was an angel that had appeared unto them. And it came to pass that he stretched forth his hand and spake unto the people, saying: Behold, I am Jesus Christ, whom the prophets testified shall come into the world. And behold, I am the light and the life of the world; and I have drunk out of that bitter cup which the Father hath given me, and have glorified the Father in taking upon me the sins of the world, in the which I have suffered the will of the Father in all things from the beginning (3 Nephi 11:5-11). In the early 1800’s in upstate New York, USA, a “Second Great Awakening” was in progress, with an upswing in religious fervor, revival meetings and competition among Christian sects for converts. A boy of 14, Joseph Smith, was the son of devout Christian parents, but he couldn’t decide which church had the truth. They all used the Bible as their source, but they could not agree on doctrine. Joseph’s family was split on the matter, some choosing Presbyterianism and others favoring Methodism. After reading James 1:5, that God would not turn away an inquiring child, Joseph determined to pray about the matter. He went one morning into a stand of trees on his parents’ property and began to pray. No sooner had he begun, he was overtaken and nearly destroyed by an unseen evil force. Calling upon God, he was delivered. 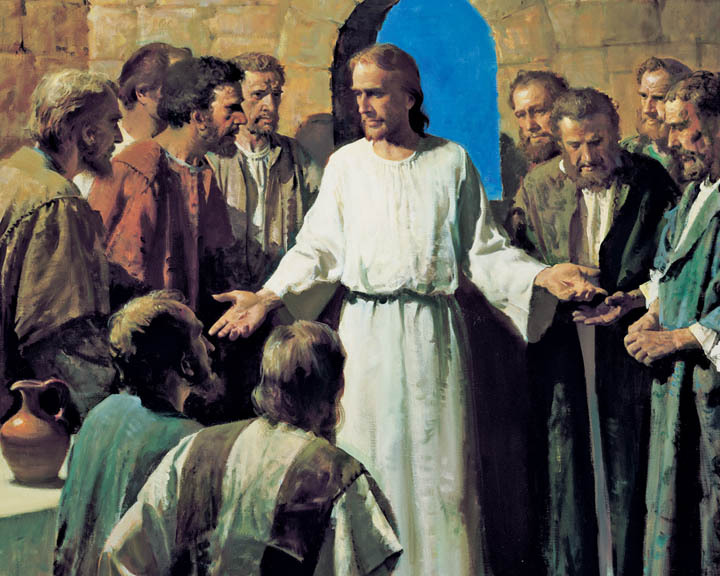 After Joseph Smith had this experience, he would receive many visions and heavenly messengers, necessary for the reestablishment of Christ’s primitive and true Church with the power and authority to administer in His name in these modern times. There are several accounts in the Doctrine and Covenants, a collection of modern revelations, of these visions. Joseph Smith was usually in the company of others when he received revelations, and one especially profound vision was also seen by Sidney Rigdon, an apostle and spokesman for the LDS Church. And we beheld the glory of the Son, on the right hand of the Father, and received of his fulness; And saw the holy angels, and them who are sanctified before his throne, worshiping God, and the Lamb, who worship him forever and ever. For we saw him, even on the right hand of God; and we heard the voice bearing record that he is the Only Begotten of the Father— That by him, and through him, and of him, the worlds are and were created, and the inhabitants thereof are begotten sons and daughters (Doctrine and Covenants 76:19-24). Again, after the dedication of the Kirtland Temple, the first House of the Lord built in modern times, the risen Lord manifested Himself to His prophet. This manifestation followed a magnificent outpouring of the spirit, as on the day of Pentecost in ancient times. Joseph’s scribe, Oliver Cowdery, was at his side and also experienced these visitations. The veil was taken from our minds, and the eyes of our understanding were opened. We saw the Lord standing upon the breastwork of the pulpit, before us; and under his feet was a paved work of pure gold, in color like amber. I am the first and the last; I am he who liveth, I am he who was slain; I am your advocate with the Father. Behold, your sins are forgiven you; you are clean before me; therefore, lift up your heads and rejoice. Let the hearts of your brethren rejoice, and let the hearts of all my people rejoice, who have, with their might, built this house to my name. For behold, I have accepted this house, and my name shall be here; and I will manifest myself to my people in mercy in this house (Doctrine and Covenants 110:1-7). After this vision of Jesus Christ closed. Joseph and Oliver were visited by Elijah, Moses, and Elias, who committed unto them the keys of forwarding Christ’s work on the earth. Christ continues to manifest Himself to modern prophets, and they in turn witness that He lives. He seeks always to bless the lives of those who love Him and to build up His kingdom on earth in preparation for His Second Coming.